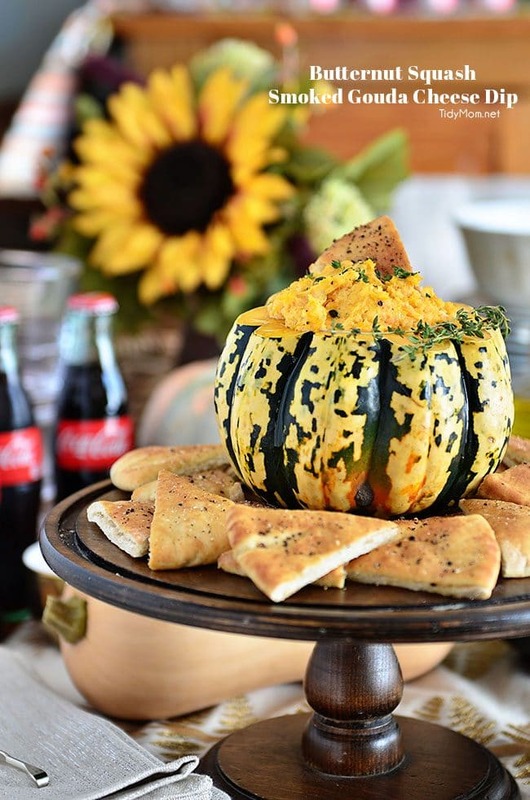 This Butternut Squash Smoked Gouda Cheese Dip recipe is a delicious fall appetizer served in a gourd with buttery seasoned pitas, perfect for fall holiday entertaining. Who’s thinking about Thanksgiving?! If you are anything like me, each year you vow to make this Thanksgiving (or any holiday) easier than the last. Entertaining can be stressful, but running around the house taking care of things is not the way to enjoy the holiday……. you should be with your guests. Whether you are entertaining a large family or a small intimate group, a holiday gathering should be enjoyed by guests AND the hostess! 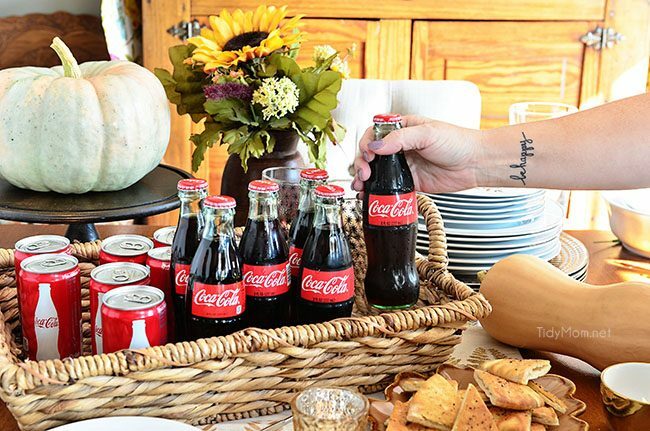 As part of my ongoing partnership with Coca-Cola, I’ll be sharing some favorite holiday recipes, tips and entertaining ideas in the coming weeks. 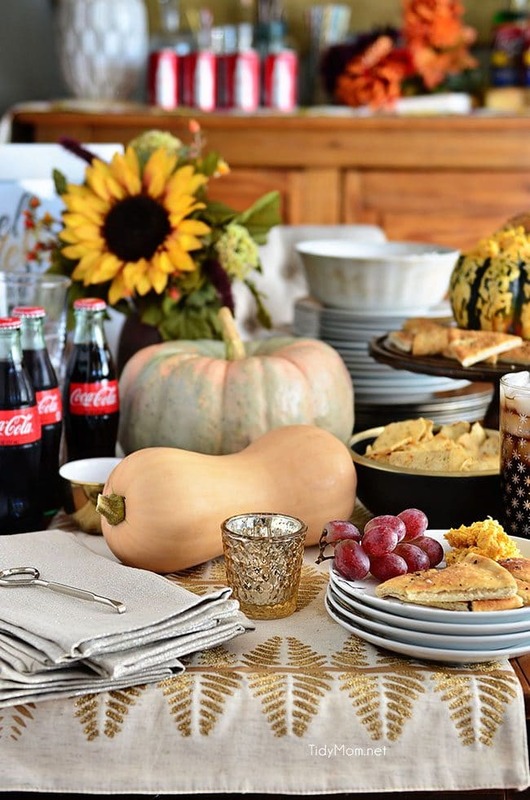 Coca-Cola has always been a part of our family, from small celebrations to holidays and everything in between. Whether its a cooler full of ice and cans, an ice bucket full of the iconic bottles or a refrigerator stocked with both, a cold glass of Coke is always enjoyed at our family festivities. This Thanksgiving will be no exception! So let’s discuss this dip first. Talk about easy! 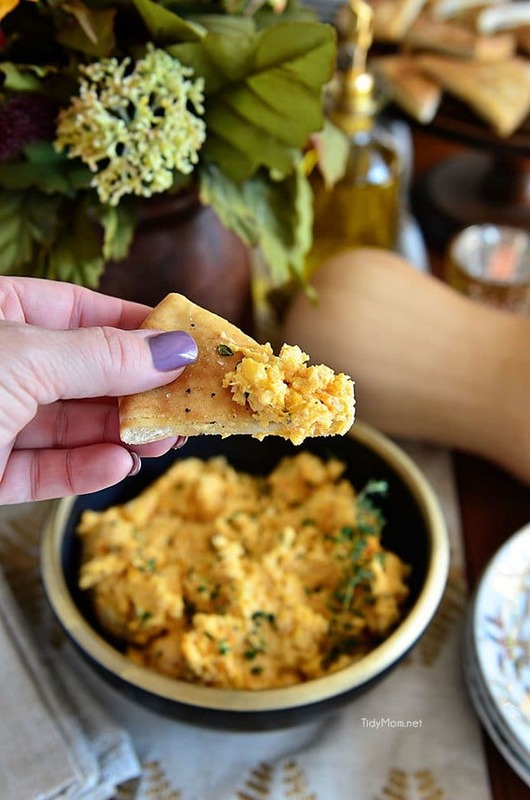 Not only is this Butternut Squash Smoked Gouda Cheese Dip recipe full of fall flavors, but it’s ridiculously easy to make. You start with some seasoned and roasted butternut squash, cooked until tender. You could even make enough roasted butternut squash for dinner, and set aside about 1/2 a cup pureed for the dip. 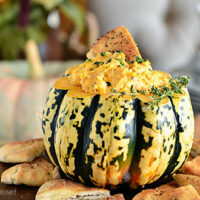 Kick it up a notch and serve the Butternut Squash Smoked Gouda Cheese Dip in a small gourd. Slice the top of a mini gourd off using a serrated knife and scoop out the seeds and flesh inside. If your gourd doesn’t sit level, you can slice a little off the bottom to even it out. Now how about some fun holiday entertaining tips to make your gatherings fuss-free and incredibly memorable. Invite your guests early: This will help you budget for food, beverages, time, chairs, dinnerware and your nerves. Choose your menu well in advance: Plan out simple dishes. Go through traditional family recipes, cookbooks, or visit your favorite food blog, or websites for ideas. If choosing a potluck, make a list of what type of food you’d like guests to bring and let them know once they accept the invitation. The last thing you want to be doing is stressing over what is going on in the kitchen while your guests are there. Offer plenty of easy appetizers and finger foods. These can include veggie platters, dips, such as Butternut Squash Smoked Gouda Cheese dip, chips and salsa, cheese and crackers, fresh fruit, cocktail shrimp etc. Line trays with colorful holiday foil and doilies. Let your guests do the pouring. A drink bar stocked with plenty of ice-cold Coca-Cola is a great way to feel more like a guest at your own party. Keep the bar out of the main flow of the party, to the side or in the corner of the main room. Guests will go out of their way to get to the bar, and some will gather there. For the Coca-Cola® bottles, remember to leave a bottle opener at the station and be sure to have lots of ice. People naturally respond to music and it’s a great way to loosen up the mood and make people comfortable. Set the tone for your party by creating a playlist that’s ready to begin playing lightly in the background to create an inviting atmosphere as soon as the doorbell rings. 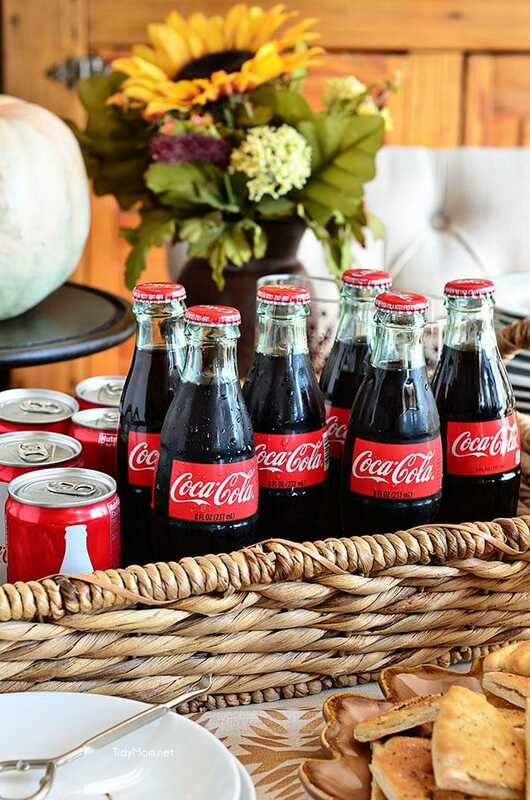 Always introduce other guests, use place cards, have small gifts for your guests, such as, personalized Share a Coke bottles – personal little touches go a long way with party-goers. The holidays are all about relaxing, spending time with your family, cherish those around you and enjoying each other! Be flexible in your plans, life happens and unforeseen holiday challenges may arise. With a little planning though, your guests will enjoy your company and the holiday meal. Don’t forget to give thanks for having loved ones near. I hope this post inspired you to relax and have fun this Thanksgiving. 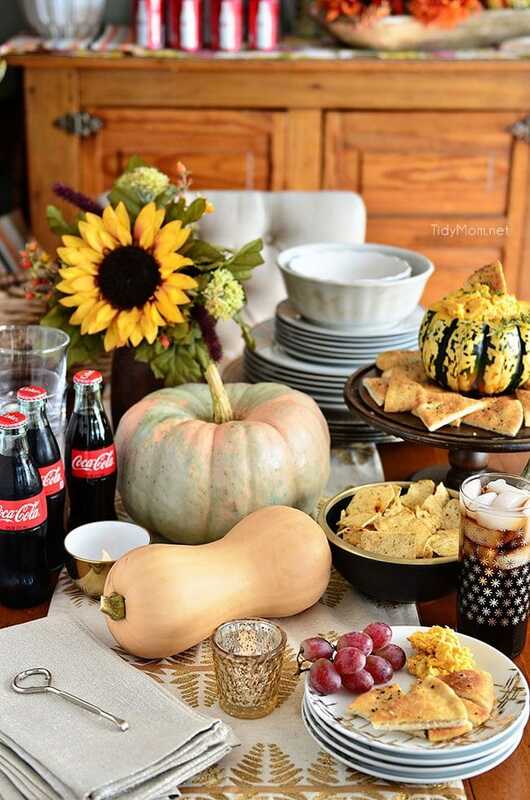 Hop over to the Coca-Cola Pinterest Page for some more recipes, entertaining ideas and inspiration to help you pull off a fabulous Thanksgiving! ……. stay tuned for more ideas from me in the coming weeks. 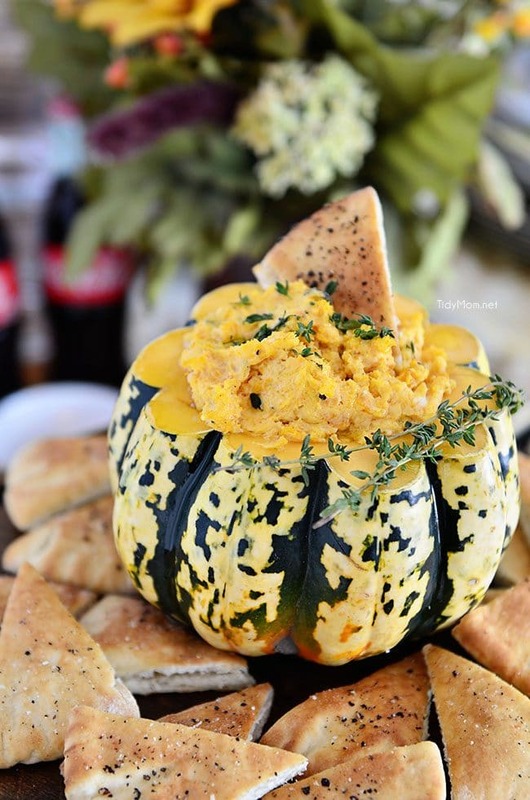 This dip is full of fall flavors and perfect for fall entertaining, especially when served in a pumpkin! Preheat the oven to 425 degrees F. Line a baking sheet with parchment paper or aluminum foil. Add roasted squash along with any remaining oil from the pan to the bowl of an electric stand mixer (or food processor), beat (or process) smooth. Add cream cheese, garlic, nutmeg and continue beating until creamy and smooth. Taste to see if you need more salt and pepper. Using a spatula, fold in grated smoked gouda. Seasoned PitasUsing a pizza cutter, cut pitas into triangles, and place on baking sheet. Place in 350F oven for 5-7 minutes. Brush toasted pitas with melted butter, and grind sea salt and black pepper over top. What are your plans for this Thanksgiving? Do you host? Do you travel? Who do you spend it with? 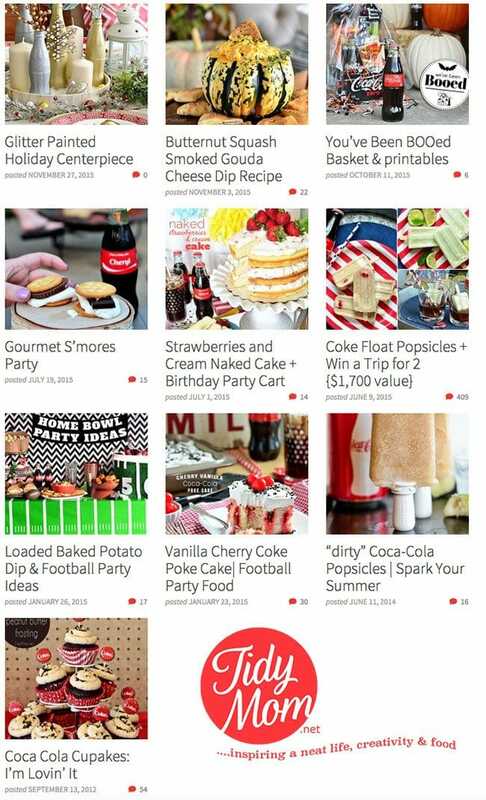 Click the image below for more Coca-Cola Ideas: Recipes, crafts, and entertaining! Disclaimer: I have a working relationship with Coca-Cola as part of their team of lifestyle ambassadors. Coke has been a part of our family most of my life, as always, all views and opinions are my own. 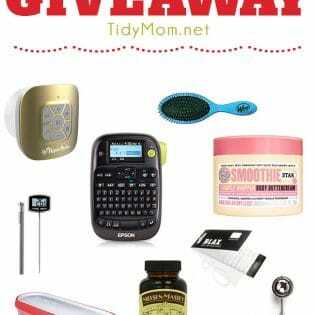 Thank you for supporting the amazing brands who make TidyMom possible! Gorgeous photos! And now I’m craving an ice cold bottle of Coca-Cola! 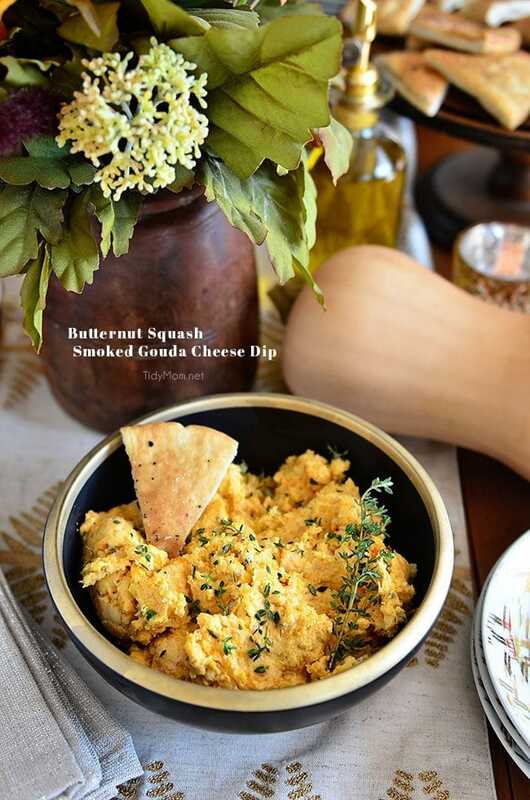 Love sweet butternut squash with smoked gouda. Your acorn squash “bowl” is too cute. 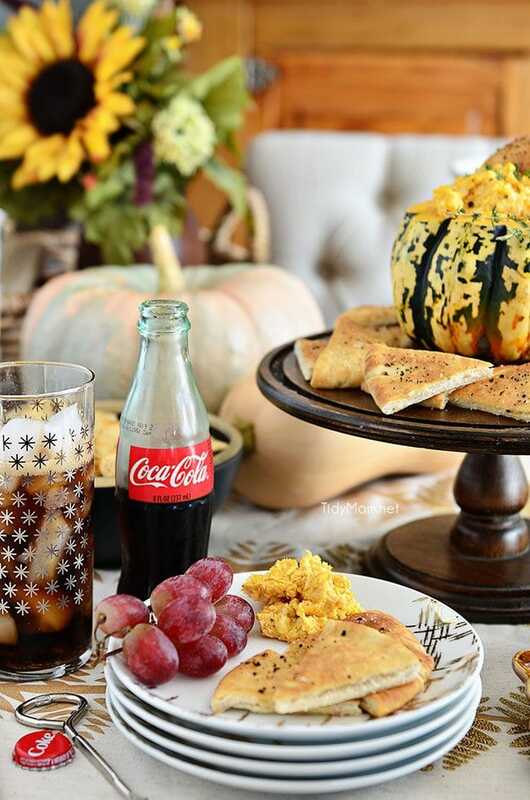 Gotta try this tonight, we miraculously have all the ingredients plus the coke! What a fun way to serve squash. Ok I would have a hard time sharing this dip, it sounds amazing!! Great post and tips Cheryl! This is genius!! You are so creative, my dear! I agree with letting guests pour their own drinks. It takes a lot of time to do that for everyone. Plus people can grab what they want and exactly how much they want. Great tips! I absolutely adore this dip recipe! Your table set up is amazing as well. I can’t wait to make this recipe. Great photos, delicious food, wonderful entertaining tips! Especially like your tip to relax. For me, there is nothing more disappointing than to go to someone’s home (party or something smaller) and have my host(s) spend the entire time running around and not visiting with guests. We came to visit with you! This turned out so pretty! A fabulous appetizer for the holidays or any fall get together! This is absolutely gorgeous, Cheryl! 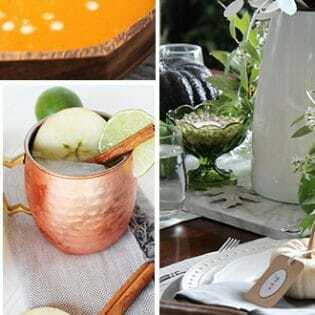 It would be beautiful on any fall table! This recipe looks delicious, and now I want to host a party!! This is such a beautiful and creative set up Cheryl. 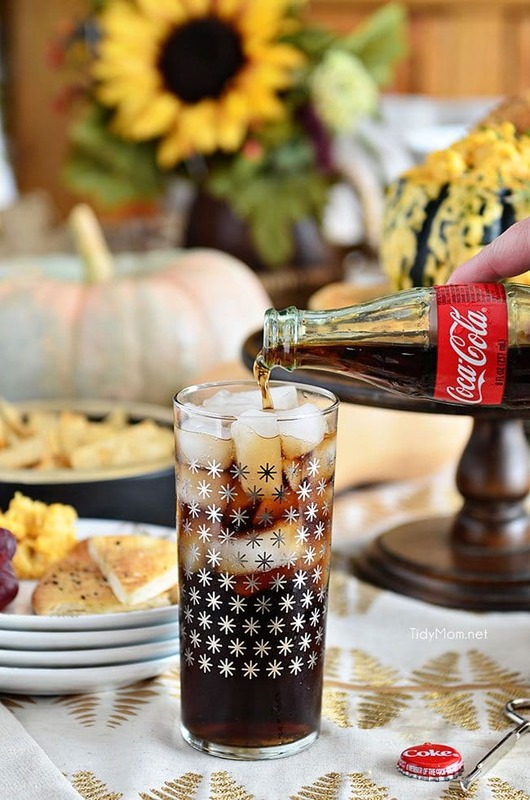 Love the dip and the Coke looks adorable and festive too! I love everything about this post! Your table looks so festive and inviting and that dip! Goodness, the flavors! Your table display is beautiful and the squash dip looks and sounds wonderful. Great tips for hosting a party too, just in time for holiday party season. This sounds so gouda!! couldn’t help myself… Thanks for the party tips as well as the dip recipe!! This dip is fantastic. Sneaking a veggie in is just brilliant. I love those Cokes in the glass bottles, such a throw back. OH YUM! This recipe is just BRILLIANT! I am adoring the set up also! Too cute! LOVE this dip! And love even more how you served it…great party tips!